If swimming throughout the year is important to you, there's no better way to accomplish your goal than with an Ameri-Dome Pool Enclosure. In addition to extending the swim season, our inflatable, vinyl domes/bubbles also reduce chemical and pool heating costs and serve as one of the most effective pool covers on the market. Our many years of experience, reasonable pricing, quality customer service, and our ongoing commitment of providing the finest swimming pool domes on the market make for an unbeatable combination! Our innovative pool dome accessories, like the Ameri-Dome Heater and Airlock Entry System, are just a couple more reasons why the Ameri-Dome is the most versatile, best-selling pool dome on the market. 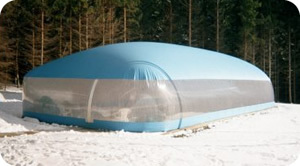 With the owner installed Ameri-Dome, nearly anyone can enjoy their own swimming pool any time of the year they desire. In the past, swimming pool domes were purchased through a pool service company or other related business. This was because the installation was simply considered to be too difficult for an average homeowner. But now, with the Ameri-Dome, almost anyone can measure, order, and install their own swimming pool dome with relative ease. To get the most out of your swimming pool, an airdome makes great sense and the low cost is often less expensive than many regular winter pool covers! The dome acts as "solar cover" by absorbing the sun, trapping warm air around the pool, and preventing the water's heat from being lost to the environment. And although Ameri-Domes were not initially designed as a safety cover for your pool, they do create an effective barrier, providing an extra measure of pool safety and protection. We have endeavored to make our web-site as complete as possible to answer as many of your questions and concerns as we could. If you have any questions that are not adequately answered here, please let us know. You will find our staff to be extremely knowledgeable and patiently helpful. Simply put, we really enjoy what we do! We also hope you enjoy this site. IF you are looking for replacement zippers, blowers, repair kits, airlocks, or replacement swimming pool domes that were purchased from Aqua-Flex (SuperSpan Domes) or Rontimco (rontimco.com) please call us at 800-982-6966. We have OEM replacement parts along with complete diagrams and plans for your domes. We also have been informed that PLASTIMAYED is no longer making swimming pool domes. We can most likely duplicate one for you if you need a new dome. Just give us a call or use the Blue "Contact US" link on the upper right hand corner of this page. We look forward to assisting you in any way possible.